Good news to NYC and it’s neighbors: According to The New York Times air across our city is the cleanest it has been in at least 50 years. The conclusions were based on the NYC Air Quality Survey, where measurements are taken at 150 locations throughout NYC metropolitan on a seasonal basis and applied regionally. While I am in support of any effort done to improve the air we breathe, I think we, the citizens of NYC, can do better. We can increase air quality awareness by improving our measurement resolution. Let’s talk about air quality on a finer scale, in our own neighborhoods, on our own street, right outside our windows! Air Quality-EGG is a project aiming to give citizens a way to participate in the conversation about air quality in their immediate environment. 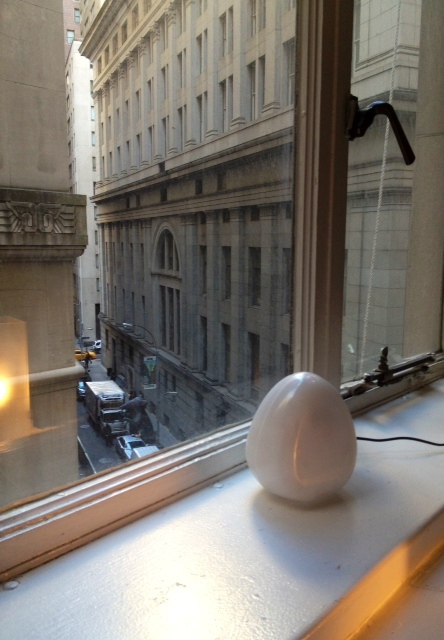 The egg resembles an ostrich egg that sits outside your window or inside your home. It has four sensors built in – Temperature, Humidity, Carbon Monoxide, and Nitrogen Dioxide. The Egg receives information from the sensors every minute and uploads it to a network cloud making all data accessible to the public. The idea is that if we implement such technology into our homes, schools and office spaces, we, the citizens and workers of New York, together, will be able to map the evolution of daily air quality across different neighborhoods. Our atmospheric science and air pollution research group (Pullen, Meir, Orton, Blumberg) is trying to help encourage more citizens to join in this effort, to strengthen and broaden the network. You can help us gain higher resolution across the NYC by implementing your own egg at home or work. Air Quality Eggs can be ordered from https://shop.wickeddevice.com for $185. The setup is simple and I have found the support team for this project to be very responsive. The egg is pre-assembled and you will be asked to create a profile for your egg, where you get to name it and include details such as location, what floor you live on, indoor/outdoor placement, etc. Once you connect it to your internet router (just like you would any other computer in your home), it begins collecting data. You can then see your specific egg and all other available active eggs across the world at: http://airqualityegg.com. Whether you purchase the Air Quality Egg or not, you can become part of the conversation by spreading the word and become active in chat forums and other media. Visit this blog again soon to see some analysis of my Egg’s data, located down on Wall St, NYC, or simply follow my Egg’s measurements on your own using the map on their website. 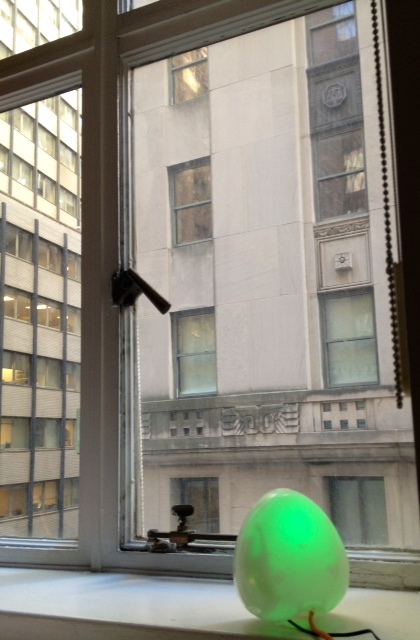 This entry was posted in air pollution and tagged air quality, carbon monoxide, citizen science, egg, measurement, Meir, New York City, nitrogen dioxide, NO2, personal, sampling, survey, Tal, Talmor. Bookmark the permalink. This device doesnt give the an accurate reading as it has to small of a view. Add the sensing of radio active particles and airborn poisons before you pat yourself on the back. Having air quality testers all over the place is a good idea but only if they give a true and accurate picture to the public. Is this device purposely designed to misslead? Or are the designers just seriously uninformed about how to properly meter air quality? I agree that the base sensors that come with the Egg are not the newest and bestest out there, (although I believe you could calibrate your own sensors to the egg); Never the less, the primary goal for the air quality Egg project is accessibility! By supporting a simple, low cost device the project is reaching higher resolution and higher frequency data. Of course for scientific research purposes, one should always validate data against available additional resources (see NYC air quality survey). Our research group is most interested in air and pollutant dispersion across the city (which I’m hoping to write more about soon), hence the high frequency and high resolution could help create an enriched picture as to how air moves around buildings and its day time dependencies. We’ll keep your questions as to data quality in mind and be sure to always look back to the higher quality sensors (or even try to cross validate) before we interpret the results. Furthermore, the moderation of these comments is called censorship. Which is a defence to the ability to misslead the public and if my comments aren’t posted please stop asking for input. I strongly advise that truth is the only way to move our society forward from this point in civilization. Knowledge must be shared freely to everyone on our planet. Misleading people t beliefs that are unfounded makes humans look like unintelligent fools to the species conscious observing body. We are better than this. Wha? Your comment was posted … so not sure where you are coming from. Thanks for the input, which was taken pretty seriously. Tal is going to reply shortly. I guess I see your point — that one should not moderate comments. That’s somewhat idealistic considering how much spam comes through here. Frankly I would love to have more comments. In any case, once you are approved one time, you have free reign to comment without approval being needed – it’s just the first time. So fire away!